Shoveling snow is one of the toughest parts of living in a 4-season climate. What’s tougher still? Maybe it’s minding all the proper snow shoveling etiquette. There are so many rules and courtesies about all types of snow shoveling things, such as space saving — you know, clearing out a spot on a city street near your home to park your car after a snow emergency. Some cities ban space saving, while others give 48 hours to save your parking space after you’ve shoveled snow from it. Then there’s the whole matter of where you should put the snow when you’re shoveling it. In the street? Probably not the best idea — it blocks the road more and will get pushed back against your car when the plows come by. At the end of the day, there’s a lot more to clearing your driveway, sidewalk, or street parking area than simply taking a shovel and pushing snow around. Yes, there really is such a thing as snow shoveling etiquette. It might make you wonder what Emily Post would have to say about snow shoveling (interestingly, the Emily Post Institute does offer snow skiing etiquette lessons). #1 – Shovel snow in front of your home, and make sure the stoop and sidewalk area are also cleared of snow. Spread ice melt on slippery surfaces, and pile snow near trees or at the street corner. Remember, if you’re a homeowner, it you could be fined for not shoveling snow! 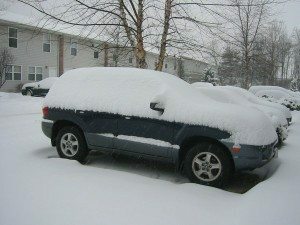 #2 – Shovel snow off your car! Don’t leave your vehicle under a pile of snow for days at a time. Remember, in some cities and counties, its illegal to leave your car buried under snow. In many places, it’s also against the law to drive with snow on the roof of your car. They make telescoping snow shovels that are safe to use on your car. #3 – When you’re shoveling your car, pile the snow neatly along the the edge of the sidewalk in common area. Don’t throw the snow onto the street, and don’t pile it onto someone else’s property (including their car). Check with your local city or county government for laws regarding how long you may save your parking space once you’ve cleared it. #4 – If you’ve got elderly neighbors, help them out and shovel their sidewalk and/or stoop. Not only is shoveling snow dangerous for older people, but many simply don’t have the strength to heft shovelfuls of snow. You’ll feel good for helping out a neighbor in need, and they’ll be thankful for the assistance. #5 – Be respectful of space saving rules, laws, and etiquette, and don’t take someone’s parking space after they’ve cleared it out unless the requisite 48 hours after a snow emergency have passed. Not only do many cities ban keeping a spot for more than 48 hours, but it’s quite rude to hog prime real estate. #6 – Pitch in and help your neighbors clear the community sidewalks and common areas. While you may only be legally obligated to clean the car and shovel the snow in front of your home, wouldn’t it be nice to help your neighborhood return to full function after a blizzard? 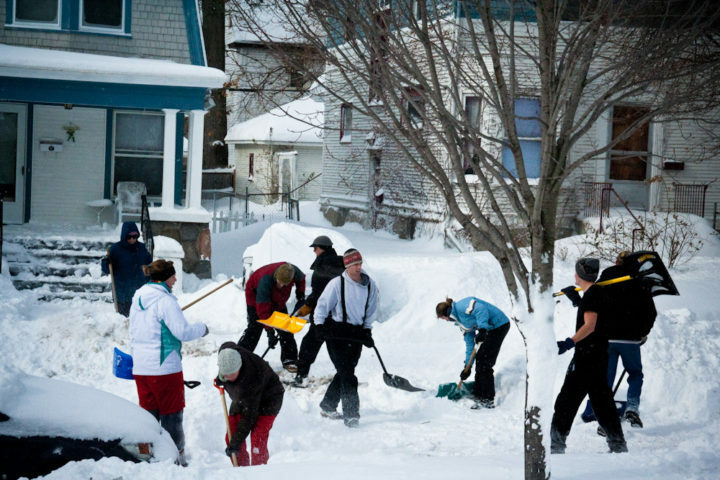 Make things fun and organize a snow shoveling block party! You’ll help turn the drudgery of shoveling snow into something and even meet more of the neighbors this way.